If you’re looking for something stressful to do with your family of four, schedule a family photo shoot. But really, family photo shoots can be super stressful, especially when there are young children involved. While they do take a little effort, with the right planning, preparation and attitude, they can score you a perfect family photo and actually be pretty fun all the while. If you’re thinking about taking family photos this fall, consider these 5 tips. 1. Outsource. While hiring a professional photographer may not be in your budget, you may be surprised to learn that there are plenty of budding family photographers looking to build their portfolio and will gladly offer a free photo session, along with some photos, in exchange for taking photos of your family’s beautiful faces. 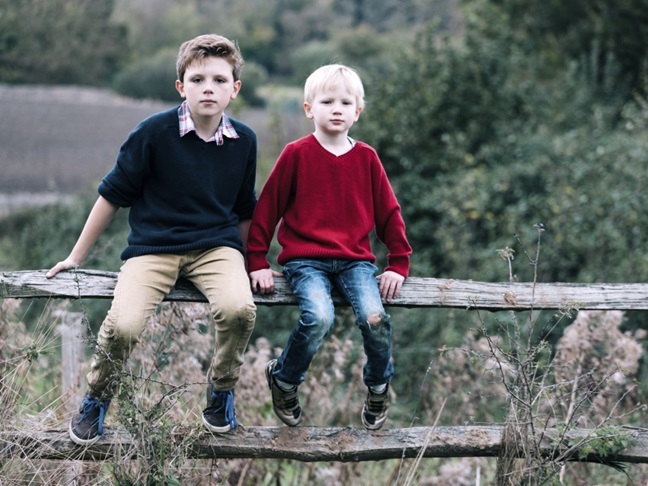 Photographers who desire to expand their business into family portraiture, photography students and even friends who take photographs as a hobby can be ideal photographers for your family’s shoot. Craigslist or your local college photography department may have numerous photographer leads worth following up. 2. Pick an outdoor location. While the background shouldn’t be the focus of your family photo, it should enhance it. Trees with leaves changing colors make a dramatic backdrop to any photo. The beach, local state park, forest or apple orchard are other locations that work well for fall family photos. Even your own backyard may provide the perfect backdrop. 3. Coordinate your colors. When it comes to what to wear, coordinating clothing can enhance the fabulousness of any family photo. When choosing clothing, it’s key to keep it simple and comfortable. It’s also important to determine if you want a casual family photo or a formal one and to choose the appropriate style of clothing. Some families prefer to wear all jeans or khakis with white tops or different shades of the same color tops for casual photos. Contrasting colors can also work well. It’s always a good idea to avoid patterned clothing and clothing with logos or other prints and distractions. The goal is to look like a group without looking like clones. 4. Pick a good time of day. While sunrise and sunset typically provide perfect lighting for outdoor shots, the best lighting in the world won’t help fussy kids smile. Schedule your family photo shoot for a time when the children are well rested and well fed. Happy children make for great family photos. 5. Have fun! When it comes to family photos, the mantra should be let go and let loose. Natural smiles come happen when people are having fun. While traditional formally posed photos tend to be common, the fun, candid ones often end up the most frame-worthy shots.